Spring is a month early and I am not complaining even though we have had precious little rain. Having come late to the gardening party I have noticed only in recent years that each spring things sprout and bloom in a slightly different order. This year the change is more dramatic: the peonies are well on their way, even as the forsythia is in full bloom. The tulips seem visibly annoyed to being pushed aside by the busy peonies; they are used to having the front garden all to themselves. The azalea, battered by autumn storms and with no snow cover to protect it from the winter wind, seems to have given up in exhaustion and pushed out only a handful of blooms from nearly bare branches. I am always particularly glad to see the tulips. The red ones are the first to appear and the first I ever planted. I put the bulbs in shortly after September 11, 2001. Before then, my attempts at gardening were halfhearted and largely unsuccessful; our yard is so shady and the soil so sandy and acidic that no perennial I planted ever came back the following spring. But the previous owner clearly knew what to plant and so the garden she built always filled in nicely. But there were a few spots near the driveway that got a little sun and seemed a little bare, and the events of that fall got me to thinking that I’d been living in our house like a renter – doing precious little to show any kind of long term commitment to a family home now buzzing with three young children. The crazy world (remember Graydon Carter announcing the end of irony?) and the empty skies of that September made me look up from storybooks and changing tables and brought me outside, and made me want to plant something beautiful, something hopeful, for the spring. So I did. And they bloomed, and have bloomed every year ever since (provided I remember to put out soap to keep the deer from nibbling the bulbs). When the trees at the front of the house grew too big we had to take two of them down and that gave me more sun and soil to work with, and my perennial track record improved: sedum, cone flowers, delphiniums, daffodils, iris, bachelor buttons, phlox, creeping thyme. A few years ago hyacinths appeared out of nowhere and they seem to be proliferating. The original daylilies are stalwart and dependable as ever. The hydrangea and the poppies are dubious and bloom sporadically. The hollyhocks are a total failure. The shady areas still baffle me; the ivies are anemic and I am the only person I know who can’t grow hostas. 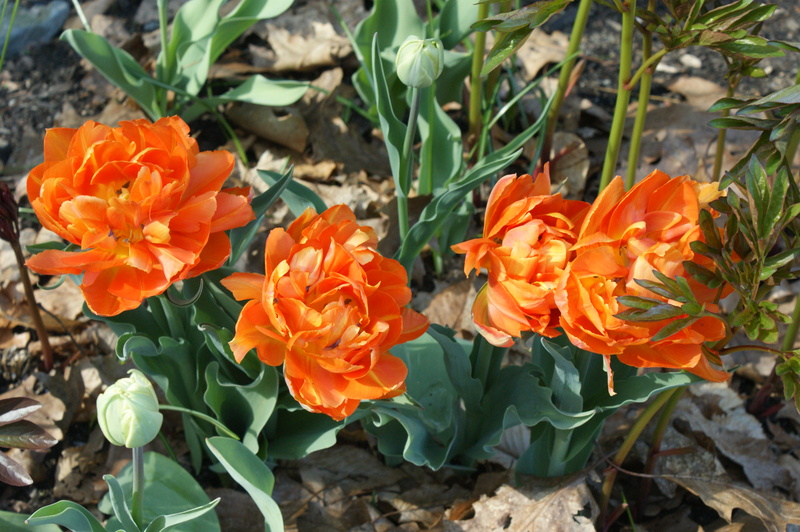 Last spring I took an inventory and ordered more tulips and daffodils to supplement my reds – I wanted orange. The box showed up in late August for fall planting, at which time I promptly broke my foot and was relegated to the couch for 4-6 weeks. My plan was to get them in just after Halloween, but when I went to plant them the box was in the recycling, empty. My husband had come upon them and handed the box to my daughter and told her to plant them, which she did, grudgingly, with little attention to where. So all winter long I waited to see if and where they would come up. This week, they emerged – a few here a few there, some in groups, some in rows, some in places where the deer dined on them so I don’t even know for sure which ones they are. 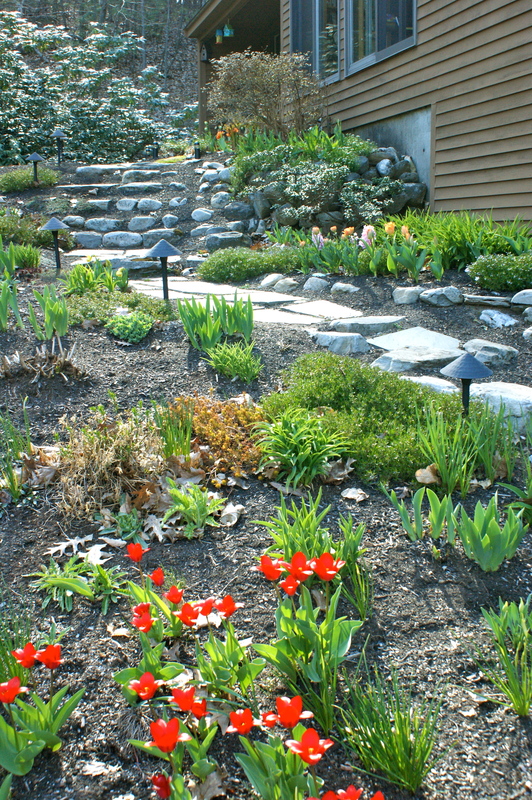 It isn’t the way I would have done it – it is better, creating a haphazard path of blooms up the front walk, starting with my 2001 tulips. Nothing at all about this whole operation went according to plan but it all seems so right – this is her senior year, and these are her tulips that she planted at the only home she has ever known. Next spring I will cry when they come up and send photos of them to her at college which will delight and exasperate her. 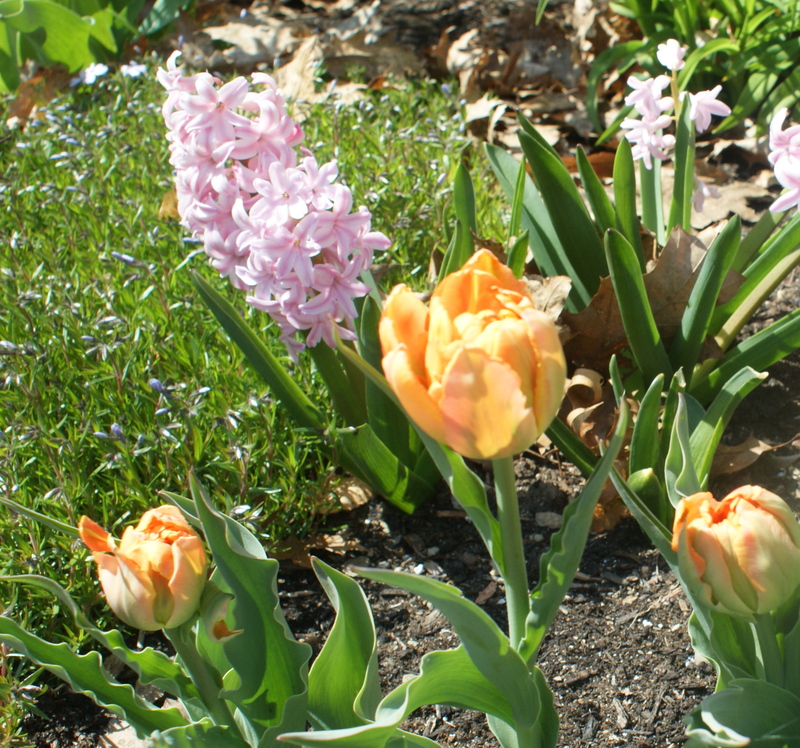 It is only now, as I type, that I recall my own mother hovering over her tulips in our back yard in Saint Louis, and how the entire city seemed to be swimming in them the last time I went to see her in hospice. Saint Louis sees spring much sooner than New England so that visit was, for us, like Dorothy emerging from the back and white of winter to full technicolor spring. 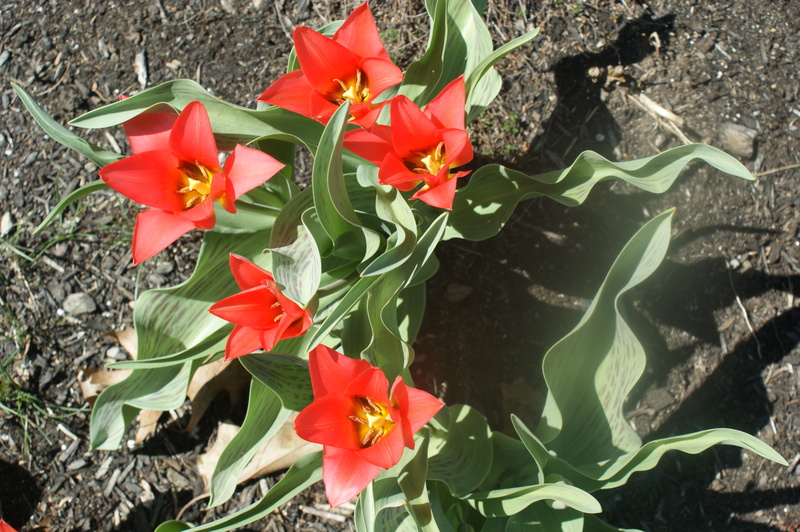 It was an intensely sad and joyful time, punctuated by tulips. Every time the deer snack on them I swear I will not plant any more, but I don’t think I can stop. Not now.